Columbus' 200th Birthday is Feb. 14! Columbus&apos; 200th Birthday is Feb. 14! It&apos;s been called the must-attend party of the year, and there are a lot of reasons to join in the fun! Presented by Grange Insurance , 200Columbus, The Bicentennial Birthday will be a night full of the people, places, tastes and sounds that have made Columbus the unique gem of a city it is. The Bicentennial Band (click here for a quick video of a recent practice session) led by MoJoFlo and Conspiracy, and including more than 200 members will provide renditions of great original music. 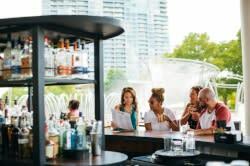 Specially crafted Bicentennial cocktails, made with locally produced Watershed Distillery vodka and gin, will be served alongside five-star food. An amazing 225 feet of 200Columbus cake will be served in style only fit for Columbus, created by Columbus State Community College Major Baking and Pastry Arts Program. This is definitely something not to miss! Bobby Floyd and Shadowbox Cabaret will offer performances, and there will be plenty of special surprises along the way. For more information and to buy tickets, click here . If this party doesn&apos;t sound like your cup of tea, don&apos;t worry! There are a lot of other ways to celebrate Columbus&apos; birthday, both this weekend and throughout the year. Visit 200Columbus.com to find the full list of events, projects and celebrations that are starting Columbus off on it&apos;s next 200 years of success! Starting Feb. 11 and running through Feb. 15, attractions, entertainment, shops and restaurants around the city are offering deals and discounts to anyone who wants to explore the city (just bring a flier with you.) Visit 200ColumbusDays.com for more information and to print your flier or save it to your mobile device.